National Referee and Coach in China. Champion of Tai Chi and Nine-Section Whip at 2007 5th WuShu International Championship in Hong Kong. Champion of Straightsword, Tai Chi, Sparring, Tuishou (Push-hands) and Broadsword at 2006 4th WuShu International Championship in Hong Kong. Champion of Tai Chi and Sparring (double broadsword vs. spear ) at 2005 World Wushu Championship in Macau. Champion of Straightsword, 2nd place of Qiangshu (spear ) and 3rd place of Sparring at the 7th National University Games of China in 2004. She has represented Wu Han University at international competition and coached abroad in China and Japan. She has practiced kung fu for over 20 years. In addition to using her wide experience as a Instructor at Legend Kung Fu, Sifu Zhou is also a proud mother. In raising her daughter, she hopes her daughter will develop respect, confidence, and focus. 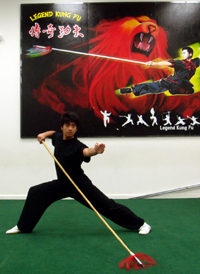 It is these same principles that are fostered in all students at Legend Kung Fu Academy. Christopher is a third degree black belt who recently graduated from University of the Pacific where he studied Bioengineering and worked as a Manufacturing Intern in Japan. Christopher has developed the confidence and focus necessary to succeed as a student and employee through years of kung fu practice. 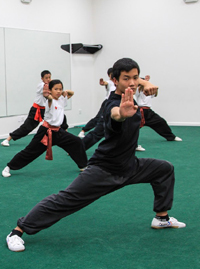 As an Assistant Instructor, Christopher continues to learn the skills necessary for success while also imparting these skills to students at Legend Kung Fu Academy. Albert Cheng is a second degree black belt who has been training for over 10 years. 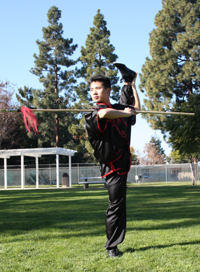 In addition to kung fu, he is an active member of Team Six Lion Dance and an avid sports enthusiast. He takes part in local football, basketball, and dodge ball leagues. Albert has been able to adapt to these various activities because of his strong athletic foundation developed at Legend Kung Fu Academy. Students undergo whole-body conditioning over a full-range of moment to develop a balance of strength, flexibility, and precise coordination. This well-balanced fitness program enables all students to enjoy a wide variety of physical activities. Waiman Tran is a third degree black belt who has trained for twelve years and was one of the most competitive kung fu practitioners in America. 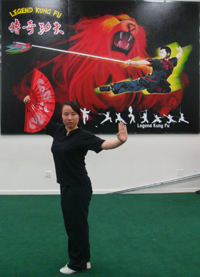 Over her years of practice, Waiman has had the opportunity of training at many of the most established kung fu schools in the area. 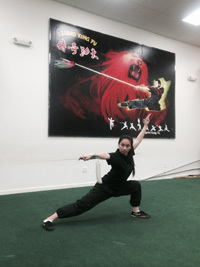 Waiman has used her rich experience in national-level competition and her wide perspective from various schools to help concentrate the curriculum at Legend Kung Fu on the core values that helped her to succeed at the highest levels of competition.